Total sample thickness is 25mm. Loaves may be sliced either mechanically or by hand, 25mm or 12.5mm thick. See Notes 1 and 2. 1. For 12.5-mm thick slices: use two slices stacked together for test sample; discard two or three two or three end slices with heels of loaf. 2. For 25-mm thick slices:use one slice for test sample and discard heel slices of loaf. 1. Position upper crosshead limit so that compression plunger is 1mm above center surface of sample. 2. Position lower crosshead limit at 40% compression (10-mm compression depth). 3. Set crosshead speed (rate of compression)at 100mm/min. 4. Set chart speed at 500mm/min (5:1 ratio of chart to crosshead extension). 5. Set full scale (range) at 1kg or desired range. 6.Center prepared sample under compression plunger, avoiding any irregular or nonrepresentative areas of crumb. 7.Compress sample approximately 10mm(40% compression). 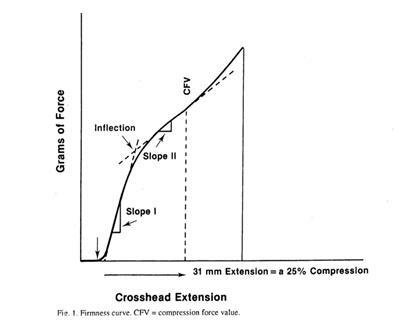 Force reading will be measured at 25% compression but curve will be drawn beyond 25% to 40%. 8. Return compression plunger to upper limit position. 10.Repeat steps 6-9 until desired number of slices have been evaluated for firmness. Evaluate six slices have been evaluated for firmness. Evaluate six slices per loaf. 1. Texture analyzer，equipped with 5-kg weigh beam, data-integration system, and plastic(lexan preferred) tooth as described in Ref.4. 1.Calibrate data-integration system with tooth in place. Use either 1-kg or full-load scale. 2.Set crosshead speed to 10.0mm/min. 3. Position upper crosshead limit so that tooth clears sample by 1-3mm. 4. Position lower crosshead limit so that tooth is 0.5mm from bottom plate. 5. Set recorder speed at 100mm/min. 1. Place 300ml distilled water into 500-ml breaker (one for each sample) and bring to rolling boil on hotplate. See Note 1. Maintain one extra breaker of boiling distilled water for makeup purposes. Graduated breakers are useful for adjusting volume of cooking are useful for adjusting volume of cooking water during test. 2. Weigh two 25-g portions of pasta or noodles for each sample being tested. See Note 2. Break pasta long goods or noodles into pieces approximately 5 cm long to permit free movement in boiling cooking medium. 1. Determine cooking time for each product by adding one of 25-g portions to breaker containing 300 ml boiling distilled water. 2. Start timer counting. Stir sample to make sure that pieces are separated. 3. Boiling stops when pasta is added. After cooking water has returned to rolling boil, maintain this condition throughout test. Partially cover breaker to help reduce evaporation and maintain consistent temperature. Use extra breaker of boiling water to maintain cooking water volume at least at 90% of original volume.